For many people in Syracuse, New York, protecting business interests also means protecting personal interests. 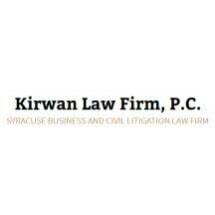 At the Kirwan Law Firm, we understand your personal investment in the work you and your company do. Our experienced litigator, Terry Kirwan, has spent more than 25 years guiding people through even the most complex legal matters. Though many commercial issues are settled outside the courtroom, the team at our law firm approaches your case with the intention of initiating litigation, if necessary. This leaves no room for making a mistake or omitting an important detail. We collaborate with you to ensure we understand your situation. From there, we can start putting together a plan for how we will accomplish your goals. We make it a priority to help you make an informed decision about your case, and we use our knowledge of the law to show you what may be possible. From our founding attorney to our office staff, everyone who works at the Kirwan Law Firm has one purpose — to provide you with outstanding legal representation. We have successfully worked with companies of all sizes and individuals throughout Central New York, and in a wide range of industries. Due to our ability to communicate clearly and find efficient solutions, we have established a record for reaching successful outcomes. Con Tech Buildings Systems, Inc.